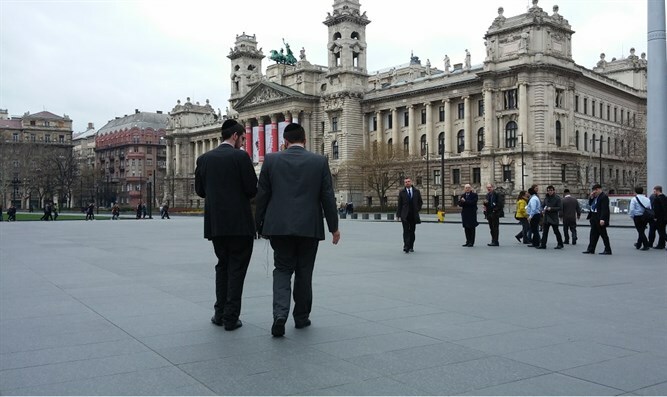 In major survey, fewer Hungarian Jews report witnessing anti-Semitism. In a major survey of Hungarian Jews, relatively few of them reported experiencing anti-Semitism yet many said it was a serious problem in their country. The survey, which the prominent sociologists András Kovács and Ildikó Barna conducted in 2017 through face-to-face interviews with 1,879 Jewish adults, was published Thursday at a press conference in Budapest. It is a follow-up on an earlier survey conducted in 1999, which examines various statistical aspects of the Jewish community of Hungary as well as members’ perceptions on a range of topics. Asked about anti-Semitism, only 48 percent of the respondents said they heard anti-Semitic rhetoric on the street in the year preceding the survey. In 1999, the figure was 75 percent. The number of respondents who said they’d experienced at least three instances of anti-Semitism was only 6 percent, compared to 16 in 1999. However, asked to quantify the extent of anti-Semitism in Hungary, 55 percent of the respondents said it was “great” and a further 10 percent said it is “very great.” “In 2017, the situation was perceived as much worse than it had been perceived in 1999,” the authors of the survey wrote. In terms of demographics, the authors said that Hungarian Jewry’s numbers are somewhere between 70,000 and 110,000. The community is losing about 2,000 members every five years, it also said. The proportion of mixed marriages has, after a brief period of standstill, once again begun to rise and stands at 62 percent among respondents aged 18-34. Three-quarters of respondents said they felt a “strong emotional attachment” to Israel. Among the younger, the non-affiliated and unobservant, some 66 percent said this. About half of respondents said they have contemplated emigrating from Hungary, with 19 percent saying they considered it “seriously.” The survey was done in partnership with the Szombat Jewish paper and the Jewish community’s watchdog on anti-Semitism, TEV. In its annual report for 2017, TEV said that it had recorded 37 anti-Semitic incidents compared to 48 in 2016, constituting a 23 percent decrease. Most of the incidents recorded last year and in 2016 featured hate speech. The rest were cases of vandalism. Hungary’s government is facing criticism for its billboard campaign and propaganda against George Soros, a Jewish billionaire and Holocaust survivor who funds liberal causes and organizations and supports the settling of hundreds of thousands of Middle East immigrants. Some Hungarian Jews say it encourages anti-Semitism, but others dispute this. This week TEV announced it was forming a partnership with counterparts in Poland, Slovakia and the Czech Republic to begin joint monitoring.